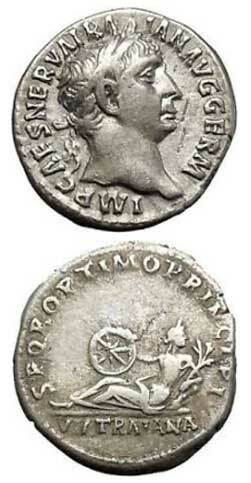 Trajan was commander of the Roman army in northern Germany when Nerva adopted him as his heir and announced him as his successor, the next Emperor of Rome. In 98 A.D. Nerva died and Trajan became Emperor but he did not enter Rome for nearly a year and a half, once he had made certain that the northern frontier was safe. 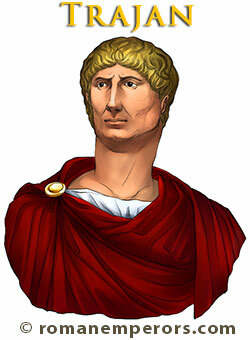 There was no uprising in Rome because of the tremendous respect the people had for Trajan. Once Trajan arrived he demonstrated his greatness, he made strong the roads, the harbors, the aqueducts, he expanded the libraries, made many repairs in the city, and he also swore an oath that he would shed no blood. He treated the people with fairness and the Senators with dignity. Trajan was born in 52 A.D. in Italica, Spain. He was of Italian descent and possibly not Spanish, some say because his next three successors were all Italian, although Hadrian's parents were born in Spain. Trajan was a military commander, and a conqueror. He commanded in the province of Germania, and was the first provincial commander to become Emperor. He led military campaigns in 101 A.D. for about five years and conquered Dacia (modern Romania). This monumental triumph is commemorated in spiral reliefs upon Trajan's column in Rome, which was erected in 113 A.D. and still stands today. He also collected annexation from the kingdom of the Nabataeans and made it the province of Arabia. He also freed the Armenians and the Mesopotamians from the rule of the Parthians. In Rome Trajan proved to be a very strong administrator, and he won the favor of the Senate as well as the upper class citizens. He proclaimed that a new day of liberty had dawned. 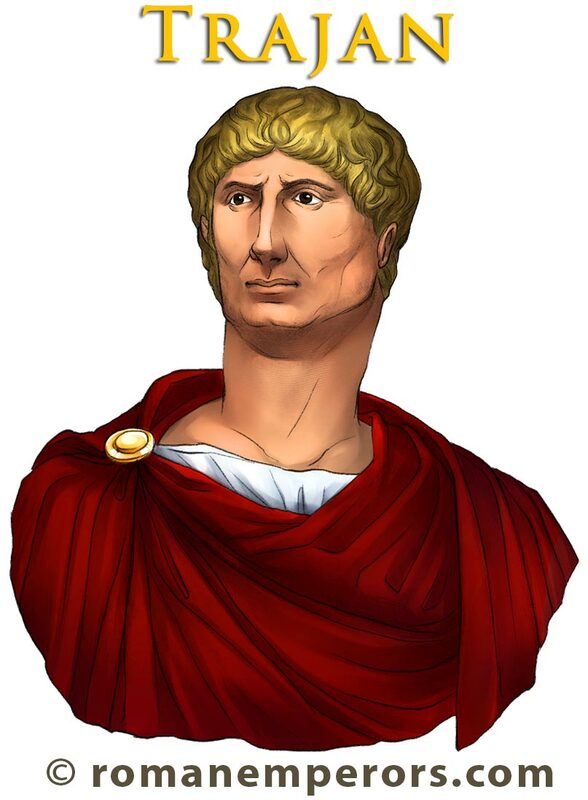 He was a strong ruler for over 19 years when he became ill in Syria and died in 117 A.D. Trajan was second in the list of the "Five Good Emperors" who ruled Rome during the Pax Romana, and lasted until the death of Marcus Aurelius in 180 A.D. There are speculations regarding the death of Trajan in Syria, as well as his naming Hadrian, governor of Syria, as his successor.